This quality hand made model is a 1:18 authentic replica of the classical 1948 Ford F-1 Pick-Up and it is limited to 2004 pieces worldwide. Remarkable for the Pick Up is its highly detailed design with workable steering, doors, hood, tailgate and a detailed engine interior and chassis. 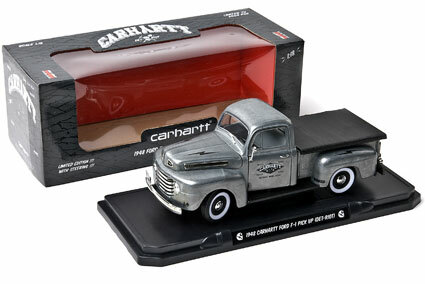 The Carhartt Ford F-1 Pick Up is made of die cast metal with minimal plastic parts and it has a four-wheel suspension. Besides, the unique Carhartt design with its classical logos and the modern pattern on the box brings the look of the Ford F-1 Pick Up to perfection. This road legend comes with an extra sticker sheet and is a true treasure for every model car collector.